Exhibitor Campaign Book 9.25" x 12"
Exhibitor's Book (9.25" x 12"). One of the rarest exhibitor campaign books we've had the pleasure of offering. This stunning 58 page example of great artwork for the cinema features a photo of the Warner Bros. Pictures studio in the front, then wonderful black and white photos of some of their contract stars with bios (such as Kay Francis, William Powell, John Barrymore, Marion Marsh, Joan Blondell, Constance Bennett, James Cagney, Dolores Costello, Barbara Stanwyck and George Arliss; Directors: Michael Curtiz, William Wellman and Roy Del Ruth) and others, then a photo of the First National Pictures studio and their contract stars and bios (such as Richard Barthelmess, Bebe Daniels, Joe E. Brown, Edward G. Robinson, Marilyn Miller, Douglas Fairbanks Jr., Walter Huston, Loretta Young; Directors: Mervyn Le Roy, Rowland V. Lee, Howard Hawks, etc). 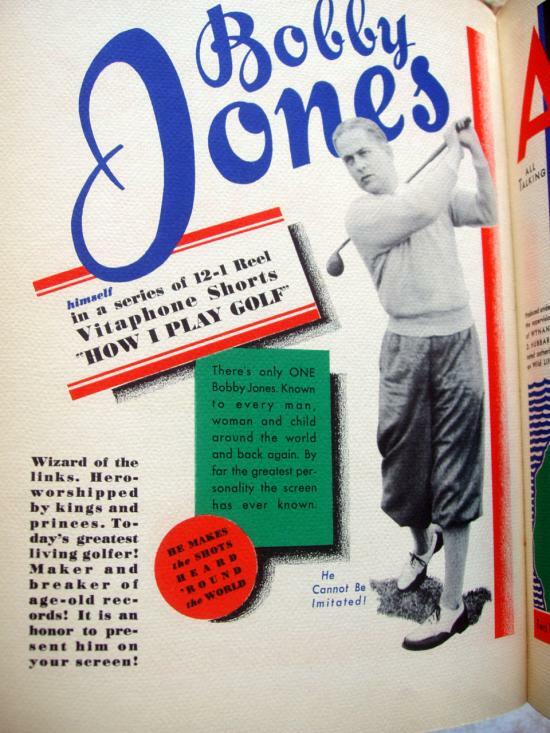 If that isn't enough, the next dozen pages are devoted to Vitaphone Studios' upcoming short subject projects with full color pages featuring Hall-of-Fame golfer Bobby Jones (for the 12 golf serials produced), Looney Tunes featuring Bosko, Robert Ripley "Believe it or Not", Merry Melodies, Ted Husing (sports radio authority) and others. This incredible Exhibitors Campaign Book is tight and intact, though does show some signs of minor wear at corners and a clean 1" seam tear at bottom of spine and another on the other side that is 3". There are a few other minor abraisions to covers resulting in a few tiny flakes of the paper. Overall, the book is in remarkable condition and has much greater appeal than can be explained in this limited space, such as the beauiful gold-leaf lining to interior covers, etc. A true treasure for the avid film enthusiast!